The Elliptical 4x6 DD design provides superior performance in extreme ground, better sensitivity to physically smaller metal targets, performance in extreme trash and physically smaller foot print for working around obstacles. Longer but narrower detection window compared to similar sized search coils. Finds the good stuff in areas heavily littered with trash. Kellyco Metal Detector Super Store. White's 4"x6" Eclipse Shooter DD Waterproof Search Coil. All orders for metal detectors will be sent signature required. If your item is defective or damaged, a return label will be sent to you for the return of the item. 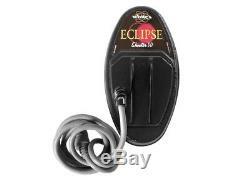 The item "White's 4x6 Eclipse Shooter DD Waterproof Search Coil" is in sale since Thursday, November 6, 2014. This item is in the category "Business & Industrial\Test, Measurement & Inspection\Test Meters & Detectors\Metal Detector Accessories". The seller is "kellycometaldetectors" and is located in Winter Springs, Florida. This item can be shipped to United States.